• DH3 style bags - 3 quart for Lindhaus DP 5 HEPA and Valzer HEPA series uprights that have a tube along the left side inside the bag chamber. This is a “top fill” style, for increased capacity to fill completely while in use. For their Aria canister vacuum, the genuine Lindhaus Micropor Hepa bag A3 vacuum bags include an electrostatically charged microfilter material made by 3M filtrete. Hospitals use this same type of filter to help keep biological contaminants under control. Part of the Aria’s 5 levels of filtration, these bags offer a higher level of protection against allergens such has dust mites, pollen, dander, mold and other microscopic particles. 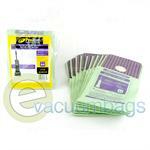 Using genuine Lindhaus vacuum bags increases the life and performance of your vacuum. 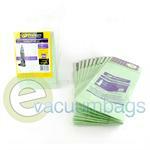 Genuine ProTeam Intercept Micro Vacuum Bags for Lindhaus Activa (Type A4) and Advance PowerOne Upright Model Vacuums. Genuine ProTeam Replacement Filter Intercept Micro Vacuum Bags for Lindhaus RX HEPA (Type PH4) and Advance Carpetwin 14/18 Model Vacuums.